Machiavelli was born in Florence in 1469. 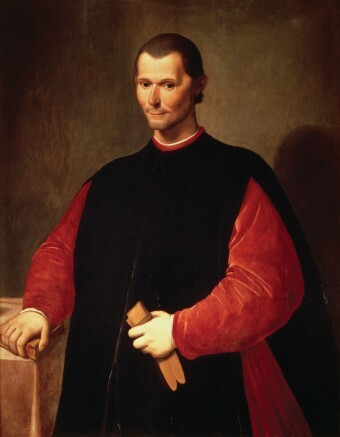 The child of an attorney, Machiavelli studied grammar, rhetoric and Latin, and as such, early on he landed a job supervising production of official government documents. He was later given a series of diplomatic missions, including to royal courts in Spain and France, as well as with the Papacy. Making his bones as a political figure at the turn of the 16th century, early on Machiavelli crafted a reputation for shameless deviousness. He also witnessed a fair bit, most notably that of the Borgia’s (Cesare and Pope Alexander VI) who were then striving to take control of a large swath of central Italy. Leading the Florentine militia against its unsuccessful resistance to the return of the Medici’s in 1512 (they had been exiled in 1494), Machiavelli was left holding the bag when the Medici’s resumed power. As such, he was tortured, jailed and exiled. Apparently fiscally comfortable, Machiavelli spent his banishment at his estate outside of the city. While away, he had plenty of time to ruminate over all he had witnessed during his years in Florentine politics, and one of the results was The Prince. Recommending treachery, hypocrisy, cunning, cruelty and ruthlessness, the book reads like a manual for getting and keeping power at any cost. It’s not quite clear when he published The Prince, although some accounts say versions were being distributed as early as 1513. A second work, Discourses on the First Ten Books of Titus Livius, was also written that year, and 8 years later, he drafted On the Art of War. Machiavelli died in 1527, and the first known printed version of The Prince appeared in 1532. A man will forget the death of his father sooner than the loss of his patrimony. People should either be caressed or crushed. If you do them minor damage they will get their revenge; but if you cripple them there is nothing they can do. Since love and fear can hardly exist together, if we must choose between them, it is far safer to be feared then loved. Let a prince have the credit [as] the means will always be considered honest . . . because the vulgar are always taken by what a thing seems to be and by what comes of it. The Prince: Political Science or Political Satire? Smart and efficient. Actually defines diplomacy very well and is therefore not repugnant. In other words, a sucker is born every minute. A valuable life lesson. Again, a very smart and observant man. Even your wife of 20 years will not likely have the entire picture of who you are. Machiavelli was talking about real life, not abstract subjects. He had observed, and been impacted by, the strife that was going on in his times. He was being honest; power does in fact flow from the end of a gun and while might not make right, it works in the vast majority of cases. The “It’s better to be feared than loved,” requires a little context. The passage also mentions that you should try to get people to be both, but fear is better than love because while you can get citizens to love you with low taxes, parades, etc. they’ll forget those things when the country hits hard times and has to take those things away, but fear won’t change no matter what happens. It also says there’s a difference between being feared and hated, and you should avoid doing things that would make your citizens hate you enough to start a rebellion.